— The music of Michael Jackson and The Jackson 5 is brought to life on the West End stage. Moonwalking into the West End after three acclaimed U.K. tours and standing ovations across Europe, Thriller - Live is a spectacular, high octane show celebrating the career of the world's undisputed King of Pop, Michael Jackson, and the Jackson 5. 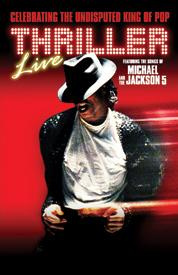 Fully backed by Sony BMG Music Entertainment U.K., Thriller - Live marks the first Jackson's dedicated live theatrical experience ever!